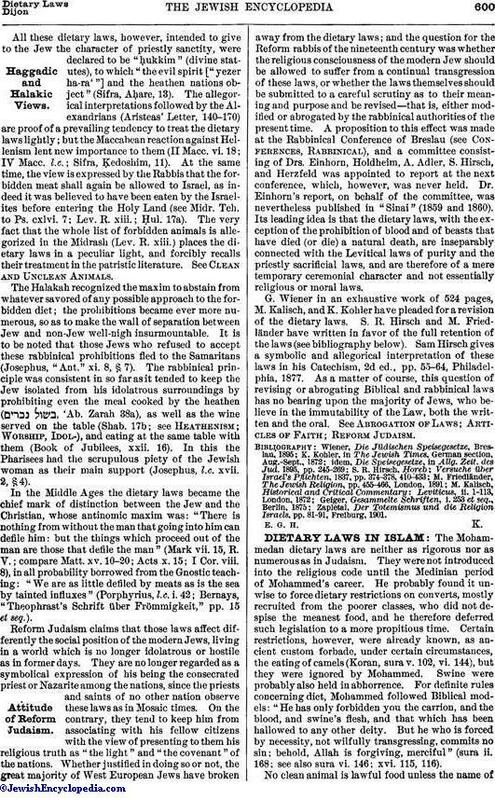 The Mohammedan dietary laws are neither as rigorous nor as numerous as in Judaism. They were not introduced into the religious code until the Medinian period of Mohammed's career. He probably found it unwise to force dietary restrictions on converts, mostly recruited from the poorer classes, who did not despise the meanest food, and he therefore deferred such legislation to a more propitious time. Certain restrictions, however, were already known, as ancient custom forbade, under certain circumstances, the eating of camels (Koran, sura v. 102, vi. 144), but they were ignored by Mohammed. Swine were probably also held in abhorrence. For definite rules concerning diet, Mohammed followed Biblical models: "He has only forbidden you the carrion, and the blood, and swine's flesh, and that which has been hallowed to any other deity. But he who is forced by necessity, not wilfully transgressing, commits no sin; behold, Allah is forgiving, merciful" (sura ii. 168; see also sura vi. 146; xvi. 115, 116). No clean animal is lawful food unless the name ofAllah was pronounced while it was slaughtered. Mohammedans are therefore allowed to eat the flesh of animals killed after the Jewish fashion. Game is also lawful if killed under the same conditions (sura. v. 95, 97). Fish and locusts, however, are exempt from this rule as in Jewish law. The prohibition of wine was introduced gradually. Drinking and gaming being equally productive of mischief, they were discussed together. At first Mohammed was satisfied with simply discouraging drinking and gaming (sura ii. 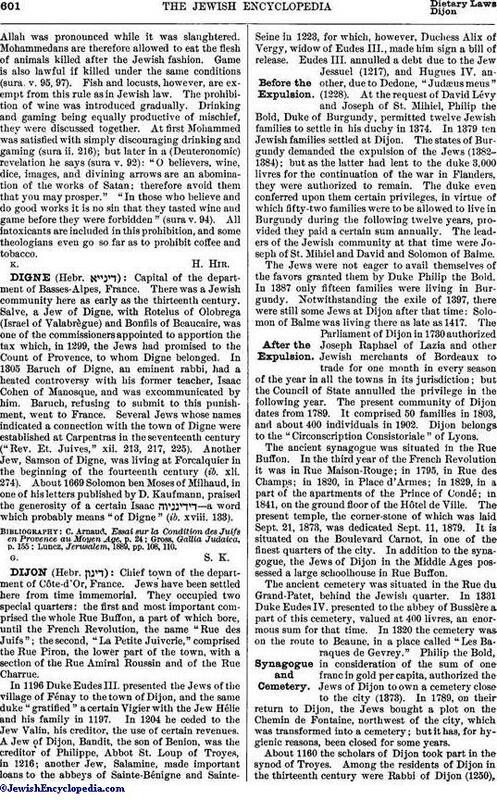 216); but later in a (Deuteronomic) revelation he says (sura v. 92): "O believers, wine, dice, images, and divining arrows are an abomination of the works of Satan; therefore avoid them that you may prosper." "In those who believe and do good works it is no sin that they tasted wine and game before they were forbidden" (sura v. 94). All intoxicants are included in this prohibition, and some theologians even go so far as to prohibit coffee and tobacco.